Fabricators can perform double-sided deburring of metal sheets as thick as 0.2 in. thick in a single pass, with no additional treatment, using the Rolei BE-5 deburring machine from CS Unitec, Norwalk, CT. The machine operates at two speeds to enable fine deburring at 600 RPM or standard deburring at 1200 RPM. With standard 28-in.-long guide-rail extensions, or when placed on its side with roller tables, it can be used to deburr large, thin sheets. opposite directions to grind both sides of the sheet as it passes through, deburring both edges simultaneously. The flap wheels can be easily adjusted as they wear—one set of wheels lasts for approximately 6500 ft. of stainless-steel sheet. 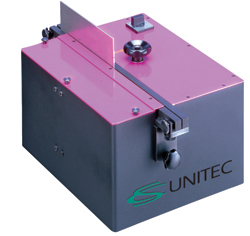 The machine is supplied standard with two 80-grit flap wheels, and can be used with optional grits (40, 60, 80 and 120) to suit the facet width and materials of a particular application. Accessories include a machine stand and a port for dust extraction.